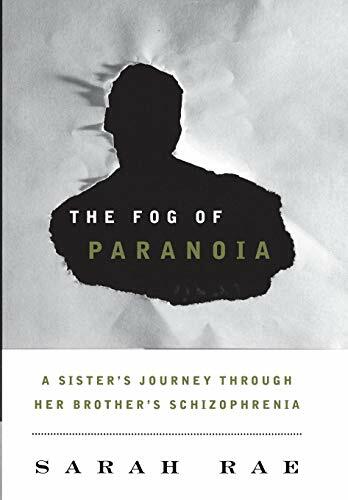 Solidly written, The Fog of Paranoia is one more book to add to those memoirs that help family members cope with a loved one’s mental illness. Ms. Sarah Rae lays this book out like most in its class: a brief recanting of childhood memories, sibling dynamics, mild parental discord, and odd family gatherings with her story slowly progressing to turbulent teenage years, the eventual diagnosis of schizophrenia, and then the difficulty of getting her brother Pat the help he so clearly needed. So much of the book deals with her own difficulties with her family, her dependency on her brother, and her own issues with anxiety and depression that Ms. Rae fails to write with the poignancy needed to truly reveal the essence of Pat and how deeply schizophrenia must have devastated his life. Ms. Rae’s love for her brother never falters, however, and that alone says something about the kind of man Pat is. Although offering nothing particularly new on the subject, Ms. Rae does a nice job blending the “teaching moments” with the personal story of her brother’s illness. Ms. Rae has become a well-educated advocate for mental illness awareness, and this book is a good source for learning about schizophrenia and its effects on family members. Someday, perhaps, stigma really will be busted, stereotypical fear associated with serious mental illness won’t exist, privacy won’t be needed to protect the “innocent,” and hope won’t be so necessary, because there will be real support, real treatment, and real recovery. Books such as The Fog of Paranoia are welcome tools toward these goals. The Fog of Paranoia is really about a sister’s journey to acceptance—not just of her brother’s illness, but acceptance of herself, of those around her, and of life’s twisted complexities.